The Midnight Freemasons: Was Charles Dickens a Freemason? Was Charles Dickens a Freemason? With the Christmas season upon us, many probably have read The Christmas Carol, written by Charles Dickens in 1843. The story is told of one Ebenezer Scrooge the recalcitrant old man who wanted nothing to do with the Christmas season and then his amazing transformation while being visited by Jacob Marley and the Ghosts of Christmas Past, Christmas Present and Christmas Yet to Come. I had attended a short presentation on Charles Dickens at the University of Illinois Library in regards to some of his works and it got me wondering if Dickens was perhaps a Freemason. I came back and did a quick internet search and found some well documented resources. The short answer to my question was no, Dickens was not a Freemason. However, he did have many Masonic connections both in his family and within his writings. 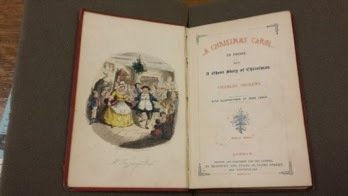 University of Illinois Copy of The Christmas Carol by Charles Dickens. “Names and history of a number of lodges have Dickensian links. The first two were both established in the early 1890s. Cheerybles Lodge No 2466 was named after the two brothers in Nicholas Nickleby and they are depicted on the lodge jewel. 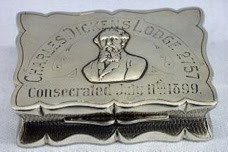 A snuff box for Charles Dickens Lodge No. 2757. The effort of resolution necessary to the achievement of this purpose, I found to be quite awful. It was as if I had to make up my mind to leap from the top of a high house, or plunge into a great depth of water. And it was made the more difficult by the unconscious Joe. In our already-mentioned freemasonry as fellow-sufferers, and in his good-natured companionship with me, it was our evening habit to compare the way we bit through our slices, by silently holding them up to each other's admiration now and then - which stimulated us to new exertions. On 9 February 1858, Dickens spoke at the hospital's first annual festival dinner at Freemasons' Hall and later gave a public reading of A Christmas Carol at St. Martin-in-the-Fields church hall. The events raised enough money to enable the hospital to purchase the neighbouring house, No. 48 Great Ormond Street, increasing the bed capacity from 20 to 75. The CBS Sunday Morning recently had an excellent story on Dickens talking about some of his personal turmoil and the influence upon his writings. Mason asked Fiennes, "Did you like Dickens when you were done?" "I like Dickens, yeah, I do," replied Fiennes. "I think Dickens is like a hungry child determined to entertain you. And a scarily perceptive child who's going, 'There's this and there's this and there's this,' and the furious imagination that just can't stop. And where that comes from is just one of those mysteries. You don't know quite where, it just happens to come from a man called Charles Dickens." So while not a Freemason himself, Dickens was aware of the fraternity and its impact on the society of his day. Why he himself did not join will remain with the ages. WB Gregory J. Knott is the Past Master of St. Joseph Lodge No. 970 in St. Joseph (IL) and a plural member of Ogden Lodge No. 754 (IL), and Homer Lodge No. 199 (IL). He's a member of both the Scottish Rite, and the York Rite, and is the Charter Secretary of the Illini High Twelve Club in Champaign-Urbana. He's also a member of the Ansar Shrine (IL) and the Eastern Illinois Council No. 356 Allied Masonic Degrees. He holds membership also in The Masonic Society, The Scottish Rite Research Society and the Philalethes Society. Greg is very involved in Boy Scouts--an Eagle Scout himself, he serves the Grand Lodge of Illinois A. F. & A. M. as their representative to the National Association of Masonic Scouters. Thank you! I am writing a film about Dickens and Urania Cottage and have a production of Christmas Carol. Bing Crosby: Freemason Or Not?